To be frank, this hasn’t been the most interesting Interbike in terms of new products. But with all the massive change over the past couple years, it’s almost a relief to have a slower show, with more brands making incremental improvements to existing products than making truly novel items. 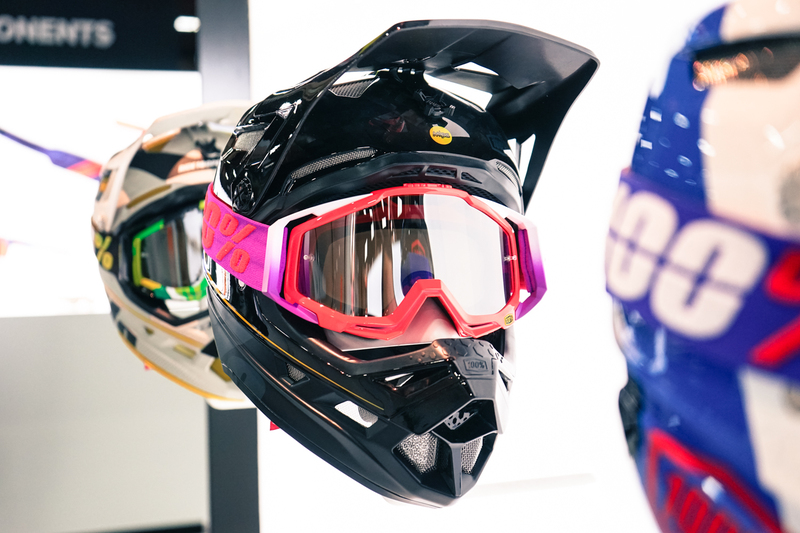 Here’s a look at a few items, some new, others new-ish, from the first couple days of the Interbike 2016 expo. 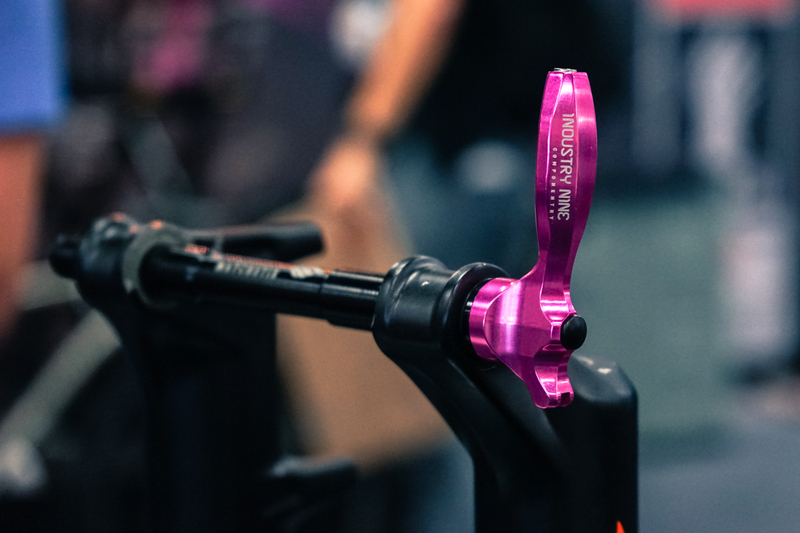 After a false start at last year’s Interbike, Industry Nine is relaunching its Match Stix thru-axles. The handle doubles as a bit driver and chain tool, and a sleeve with up to four bits and a SRAM Missing Link is housed in the axle. To make it ready for market, I9 reshaped and strengthened the handle, put a zinc coating on the six included bits and built a presta valve core tool into the end of the sleeve. The axles will be available for RockShox and Fox forks, in both Boost and non-Boost lengths. Front axles will be shipping on October 12th for $160 with bits. 100%’s carbon-shelled Aircraft helmet is now only available with MIPS, which hikes the price from $400 to $450. 100% says that they tweaked the shell slightly to fit the system into the helmet, but that sizing remains the same. Colors have also been updated for 2017. 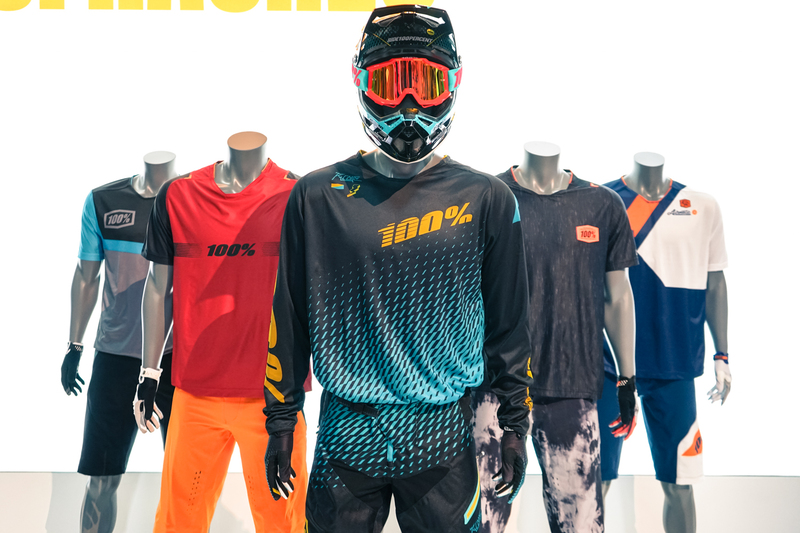 No, it’s not an NSYNC show; it’s 100%’s new soft goods lineup. The brand now offers three lines of apparel. 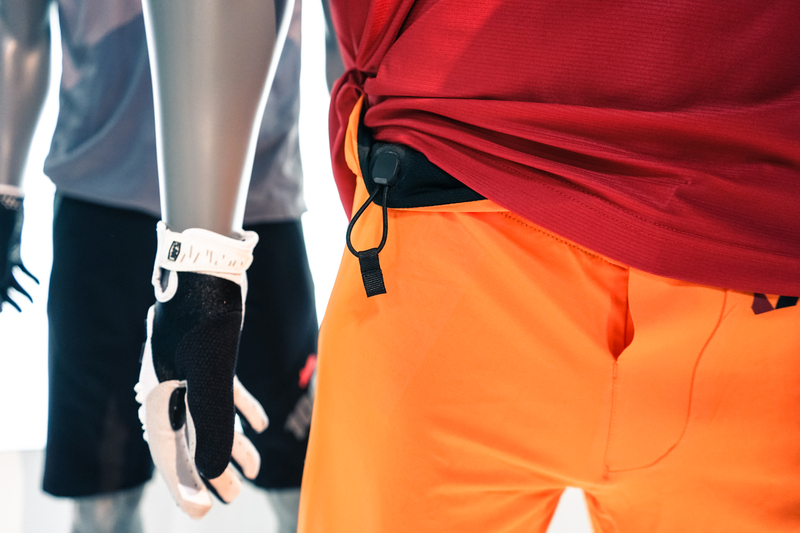 For DH use, there’s the R-Core kit, which includes jersey, pants and shorts, shown up front. For all-mountain, 100% offers two options: the more economical Airmatic kit, shown in the back row, and the high-end Celium kit, which is shown in the center row. More details and pricing at ride100percent.com. 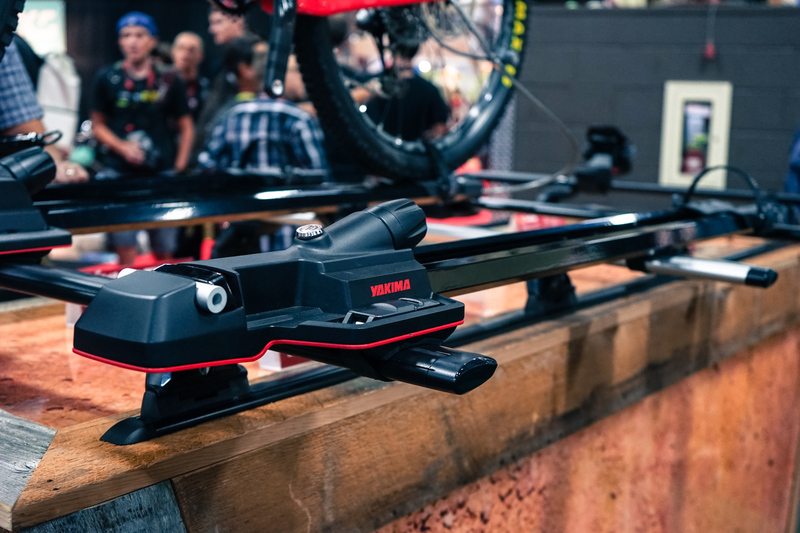 Yakima has two new mountain-bike racks: the HighSpeed (shown above) is a fork-mounted roof rack with a clamp that can handle any axle size. The tightening knob is torque-sensitive and clicks when the axle is secure. The rack is also versatile as far as mounting is concerned, with rubber-wrapped steel straps that can secure to the vast majority of crossbars. The straps can be replaced with T-bolts if you’re one of those fancy folks with aero bars. MSRP is $220, locking core not included. If you want to keep both wheels on, Yakima also has the new HighRoad, which has similar features to the HighSpeed and retails for $230. 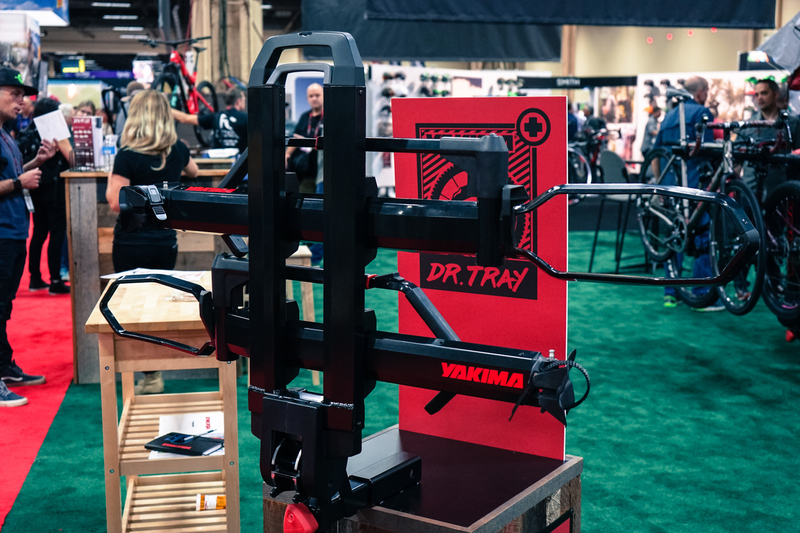 The Dr. Tray is Yakima’s new remedy for hitch-mount woes. At 34 pounds in the stock two-bike configuration (a third tray can be added on), Yakima says it’s the lightest in its class. The tilt lever at the top allows for easy one-handed operation, and the trays can be adjusted horizontally to avoid handlebar/seat interference. The tightening knob at the base of the rack expands a wedge inside the stinger, which keeps the Dr. Tray from wobbling. The rack will retail for $580 when it hits the market in March. 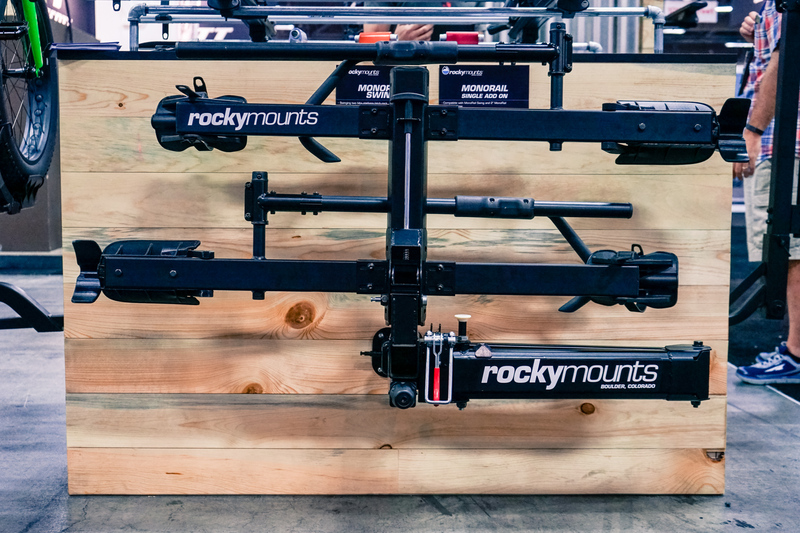 RockyMounts’ MonoRail Swing is a lower-end version of the SplitRail, but it’s hinged to allow it to swing completely out of the way for full access to the rear of the vehicle. The production version will have a more polished look than this prototype, and will be compatible with RockyMount’s add-on trays. The trays can accept tire sizes from 29″ all the way down to 20″, including fatbike tires. Unlike with the SplitRail, there’s no horizontal adjustment for the trays. Retail is $530, and the rack will be available in March.